For nearly a decade, Ecstasy kingpin Oded Tuito was the mastermind behind a drug ring that used strippers and Hassidic teenagers to mule millions of pills from Holland to the party triangle—Los Angeles, New York, and Miami. 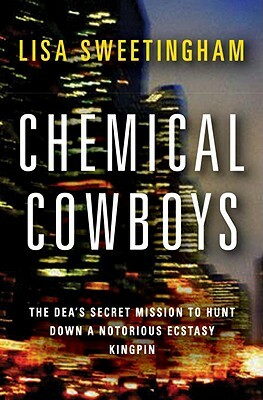 Chemical Cowboys is a thrilling journey through the groundbreaking undercover investigations that led to the toppling of a billion-dollar Ecstasy trafficking network— starting in 1995 when NewYork DEA Agent Robert Gagne infiltrated club land to uncover a thriving drug scene supported by two cultures: pill-popping club kids and Israeli dealers. Gagne’s obsessive mission to take down Tuito’s network met unexpected challenges and personal discoveries that almost crippled his own family.Weaved into the narrative are the stories of Tuito’s underlings who struggled with addiction as they ran from the law, and the compelling experiences of a veteran Israeli police officer who aided Gagne while chasing after his own target—a violent Mob boss who saw the riches to be made in Ecstasy and began to import his own pills and turf warfare to the U.S.
"Sweetingham, a former CourtTV.com reporter best known for covering the trials of Michael Jackson, Robert Blake and Scott Peterson, chronicles the undercover DEA operation to bust a lucrative ecstasy trade. The drug was perfected in 1976, became widespread in the early ’80s and was made illegal in 1985; it all but defined the burgeoning the late-’80s rave scene. Since ravers were throwing them down like candy, the demand grew, and domestic dealers couldn’t keep up. Enter Oded Tuito, a slick dealer from Israel who was doggedly tracked by Robert Gagne, a crusty DEA agent from New York. Sweetingham spent four years traveling the world in search of answers. Her debut is loaded with facts and figures about the dealers and their clients–how many pills were bought and/or sold, how much said pills cost, etc.–but she’s such a skilled storyteller that the numbers never get in the way of the narrative. Her portrayal of Gagne is particularly on-point. He comes off as heroic–not necessarily a hero, per se, but an obsessive workingman whose only goal is to get the job done. Sweetingham also does a nice job depicting the “Club Kids” scene, and her coverage of the Michael Alig murder case is so smooth that it’s well worth revisiting this oft-reported story. Most importantly, she manages to humanize many of the criminals, notably Tuito. If her bad guys were merely monsters, her book would be merely competent. Imbued with complexity, Sweetingham’s readable text should reach an audience beyond true-crime buffs. A gripping international cat-and-mouse-and-Club-Kids thriller."